i Click 'view all' to instantly compare this ok deal with offers on other top chef's knives. 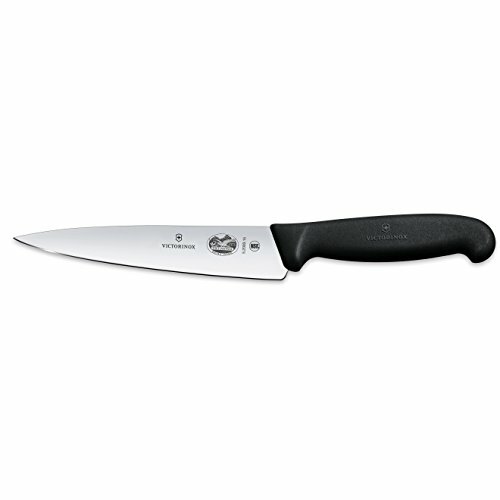 Victorinox 6 Inch Fibrox Pro Chefs Knife is currently selling at $33.48, approximately $0.78 higher than average, giving a potential saving of $1.47 right now. With a lowest price of $26.99 and an average of $32.70 it is selling on the high end of its usual range. Price volatility is 11.14% (meaning it changes all the time), so the price will most likely drop in the next few hours. Right now this product is a recommended 'ok deal'. 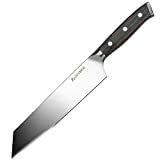 Compare the current price, savings (in dollars & percent) and Buy Ratings for the top Chef's Knives that are closely related to Victorinox 6 Inch Fibrox Pro Chefs Knife. Here is how Victorinox 6 Inch Fibrox Pro Chefs Knife compares with other leading Chef's Knives. Victorinox Swiss Army Cutlery Who is Victorinox? Although Victorinox is known the world over as the creator of the Original Swiss Army Knife, the company started out in 1884 as a cutlery workshop. By the time company creator Karl Elsener delivered his first pocket knife to the Swiss Army, his cutlery business was already booming. Over the next century, Victorinox cutlery became a top-rated choice among professionals worldwide, with over 300 blades to offer. Victorinox knives have regularly appeared as highly ranked and recommended kitchen tools in Cook's Illustrated, Men's Health, The Cincinnati Enquirer, New York Magazine, and Natural Health, just to name a few. In 2009, the company announced a partnership with professional chef, Daniel Humm, of Eleven Madison Park in New York City. In addition, building on the success of its cutlery business, Victorinox has brought all the same quality and expertise to a wider range of products and accessories, including other kitchen tools, pocket tools, watches, luggage, and clothing. Victorinox had been a staple in European commercial cutlery for over 50 years when approached by New York's R.H. Forschner, known since 1855 as a builder of scales for butchers, to be their sole cutlery supplier. The two companies joined forces in 1937, and R.H. Forschner subsequently became North America's dominant professional brand, as ubiquitous in the bustling meatpacking plants of the Midwest as it is in the gleaming, four-star restaurant kitchens of Midtown Manhattan. As a division of Victorinox/Swiss Army Brands, R.H. Forschner marketed cutlery under the brand name "RH Forschner by Victorinox" and distributed to the commercial, food service, and retail trade classes. That brand has been considered a top choice of professionals worldwide with over 300 styles of blades bearing the R.H. Forschner name. However, in 2009, in conjunction with Victorinox's 125th anniversary, the company, Victorinox Swiss Army, Inc., has decided to remove the "RH Forschner" name from all blades. Blades thenceforth only include the "Victorinox" name. What is a stamped blade? A stamped knife can usually be identified by the absence of a bolster. Stamped blades are cut into their shapes from cold-rolled pieces of steel and then ground, tempered, and sharpened. Creating them requires many less steps than forging and results in lighter, narrower blades. Some professionals prefer the thicker, heavier forged blades, but many pros, who spend much of their day cutting and slicing, enjoy a lighter knife since it's less fatiguing and easier to manipulate at speed. Stamped knives are easier to produce and therefore less expensive. They perform very well and can approach the quality of a forged blade, but not the weight or feel. Victorinox manufactures a complete range of stamped blades with unique, patented Fibrox handles and they are considered among the greatest values in the knife industry. What knives do I need to own? Paring: The most common to own and use, a paring knife is generally for small cutting jobs and peeling of vegetables or fruit. The blade size is usually from three to four inches. Choose the shape and size to fit your hand. Since this is one of the more versatile knives, owning more than one is recommended. 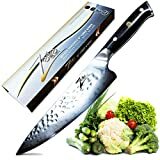 Chef's: The most important tool and essential to every cook, a chef's knife is most often used in a rocking method to mince, dice, and chop vegetables and herbs. This one is known as the chef's best friend. Slicer: Most commonly used to slice meats, poultry, and seafood, the slicer is an important companion to any host or hostess. Boning: As its name suggests, a boning knife is used to trim or remove meat and fish from the bone. Bread: Designed with a special edge, a bread knife makes easy work of cutting through crusty bread, pastries, or any item with a crust and a soft interior. 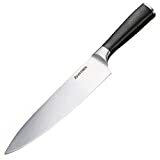 Fillet: Most often used by pros and seasoned home chefs, the fillet knife is used to fillet meat and fish. Cleaver: An important addition to any collection, a cleaver is often used to cut or chop through bones. Santoku: This knife combines the features of a cleaver with a chef's knife. The curved blade helps the rocking motion used for chopping, and the wide blade works well for scooping sliced food off a cutting board and for crushing garlic. The santoku can also be used to slice meat and has a narrow spine for making thin cuts. Utility: An all-purpose knife often referred to as a sandwich knife, the utility knife peels and slices fruits and vegetables, and even carves small meats. Shaping: With its curved blade, a shaping knife is great for small precision cuts where control is essential, such as peeling, trimming, or garnishing. What are the different knife edges and what do they do? Straight: The vast majority of Victorinox knives come with a straight or fine edge. This means it has a perfect taper along the blade and no serrations. It is designed to cut without tearing or shredding. Serrated: An edge designed with small, jagged teeth along the edge. Scalloped: A blade with waves along the edge generally used to cut breads with a hard crust and soft interior, as well as tougher-skinned fruits and vegetables. Granton: This edge has hollowed-out grooves or dimples on the sides of the blade. These grooves fill with the fat and juices of the product being cut, allowing for thin, even cuts without tearing. Even with the grooves, these are still straight-edge knives and can be honed with a sharpening steel. How should I care for my cutlery? After use, knives should not be allowed to soak in water. The best practice is to hand wash and dry them immediately. This is especially true if they have been used on fruit or salty foods, which may cause some staining, even on stainless steel. Most knives require very little maintenance and it is worth the effort to protect your investment. Though Victorinox knives are dishwasher safe, this is strongly discouraged. The dishwasher's agitation may cause damage. Additionally, harsh detergents can be harmful and cause pitting and spotting on the blades. The handles may also discolor and develop a white film with constant use of the dishwasher. Plus, intense heat associated with dishwashers is not good for the temper of the blade. All quality knives require proper maintenance to keep them in perfect cutting shape. The best of edges will quickly dull if it strikes metal, glass, or Formica. A wooden cutting board makes the best cutting surface. And, if a slip occurs, a proper cutting board is safer for the user. Frequent use of a Victorinox sharpening steel will keep blades in tip top working condition. All straight-edge knives need steeling to keep their edges. How to "Steel" a Knife Steeling a Knife Hold the steel firmly in your left hand with the guard positioned to stop the blade should it slip.Hold the knife in your right hand and place on top part of steel as shown.Raise back of blade one-eighth inch.Now, moving the blade only, draw it across the steel in an arching curve, pivoted at your wrist. The blade tip should leave the steel about two-thirds of the way down.Repeat the same action with the Blade on the bottom side of the steel. Always maintain the same pressure and angle on both sides of the steel.Repeat five or six times. How should I store my knives? Safety is the biggest concern of storage, both to the user and to protect the knife's edge. Choices include a knife magnet, knife block, drawer insets, and also individual knife protectors.